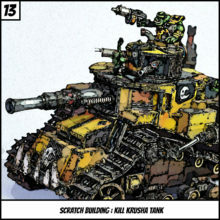 About three years ago when we bought our cutting machine I had the brilliant idea to create a papercraft tank or at least something big for my miniatures. After my first poor attempt, I dropped it… It was just to much work to convert all pdf pages of the template to a digital format my cutter could understand and getting the right paper, so it would not fall apart after I started to glue it together, was also not really tuning out as I wanted. But recently my best friend stated he would really like to see a project come alive from beginning to end in every details available. So at the point I started to think… And then I decided to make me a project. The tank.. it was still in the back of my head. Motorize it. Get those big tracks RC controlled..
Well that sums it up high level. So I started last week. The main goal is to have something to show within 6 months.. (doesn’t have to be fully ready then but basics must work) And build it all with a limited budget of aprox. 60 euro’s. So major challenge to do in between daily life.. But lets give it a shot. I have started last week and will shortly show the first progress made..